If you're on city or well water in one of our local areas the in-home water analysis is FREE*. 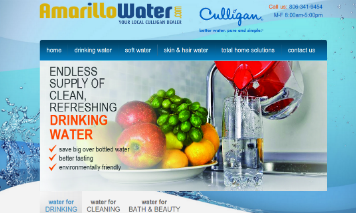 Get a free, professional Home water analyisis in your home. 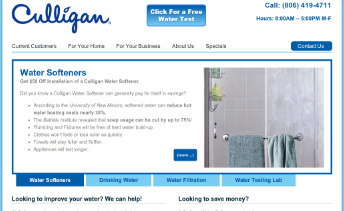 Culligan will test your water, inspect your plumbing, provide you with treatment options and make sure you're completely educated on your specific water solution. We provide water treatment for homes and businesses including water filters, water testing, water softeners, reverse osmosis drinking water systems, bottled water, well water, and deionized water. Culligan has been serving the Texas panhandle since 1940.